Brazilian President Dilma Rousseff is making her first official visit to Cuba with the emphasis on fostering business ties. Communist-run Cuba, under US trade sanctions for 50 years, has seen some economic reforms under Raul Castro. Ms Rousseff is due to hold talks with Mr Castro but it is not clear if she will meet former leader Fidel Castro. With the focus on trade, she is likely only to raise human rights issues privately, Brazilian media reported. The Brazilian government last week issued a visa to Cuban dissident blogger Yoani Sanchez to allow her to visit Brazil for the premiere of a documentary about media freedom in Cuba. This could put pressure on the Cuban authorities to allow Ms Sanchez to travel abroad, correspondents say. President Rousseff, who as a young left-wing rebel was tortured under military rule in Brazil, has said human rights are a priority of her government. Brazil wants to play a major role in Cuba's economic opening. One key opportunity here is the upgrade of the port of Mariel. The construction work, financed by Brazil at a cost of $682m, includes a "special development zone" that will house export industries. President Rousseff will be hoping that Mariel will open new markets for Brazilian firms not only in Cuba but in Central America. 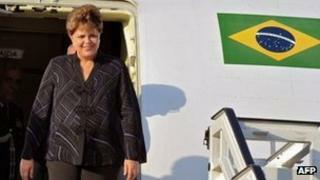 But Brazilian officials say the main focus of her visit will be boosting ties and economic co-operation. Ms Rousseff will visit the port of Mariel, where Brazilian company Odebrecht is carrying out a multi-million dollar modernisation of the harbour. The project to turn Mariel into Cuba's main commercial harbour and a hub for oil exploration is being funded by the Brazilian national development bank, BNDES. President Rousseff will travel on from Havana to make her first official visit to Haiti, where Brazilian troops lead the UN peacekeeping force.